The Pro-Ject Stream Box DS net is a high-specification music client that is designed to offer audiophile playback of your entire digital music library in a convenient and appealing way. By utilising a chip-set normally associated with products at a far higher price-point, Pro-Ject have produced a highly musical device that will play all of your digital music sources. Whether you want to play from an iPod, listen to internet radio, link with your NAS drive, or unlock the potential of your HD music stored on a hard drive, the Stream Box DS can help you. 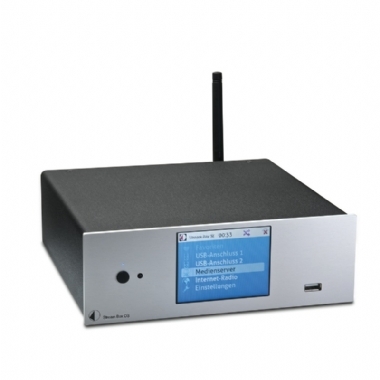 The inclusion of a remote and a large high-visibility screen makes navigation and playback easy, while the multiple connectivity options mean the Stream Box DS is a worthy client for any high-fidelity application. Box Control by Pro-Ject Audio is a brand new control application designed to streamline your entire listening experience. By using a purpose-built NetAPI software, which is pre-installed on all Stream Box DS net streamers, Box Control can offer full-control of the entire Stream Box system - including navigating hard drives and playing Internet Radio. With the use of a free application - available on the App store for iPhones or iPod Touch, and through the Android Market - the Stream Box DS can be used as an Air Play-like product. Simply install the Application onto your device, open it up and press the "My Music" icon. Select an album/track to play, and when the pop-up screen 'Play On' appears, select Stream Box DS. Please note, performance is most stable when used on a strong wireless network, and with lower file-sizes. By downloading Jamcast from SDS Technologies, users can set-up their Stream Box DS as a "Virtual Soundcard" on their network. Jamcast allows the playback of all audio from a computer to be transmitted to a Stream Box DS over the network, opening up such premium services as Spotify, Grooveshark and Last FM. Simply go to www.getjamcast.com and download the free 14-day trial (which is later upgradeable, at a small cost), and install the software onto your PC. Once installed, go to your Stream Box DS and select "Media Server", "Jamcast" (folder), "Virtual Soundcard" (folder), "Virtual Soundcard". Now, all the audio from your PC will be transmitted to the Stream Box DS. Please note, a stable wired connection on the computer and the Stream Box allows for a more solid performance.